Women who lead a sedentary lifestyle have faster-ageing cells than those who exercise every day, research suggests. Research on 1,500 women aged 64 to 95 found those who spent many hours sitting and exercised for less than 40 minutes a day had cells that were biologically eight years older. As people age, their cells age, causing DNA protectors to shorten and fray. But health and lifestyle factors may speed up the process, researchers from California said. Even in old age, it was important to keep active and avoid sitting for more than 10 hours a day, they said. During ageing, tiny caps on the ends of DNA strands naturally shorten. These telomeres - which have been likened to the plastic tips of shoelaces - are there to prevent chromosomes from deteriorating. Telomere length is one indicator of biological age, which does not always match chronological age. Shortened telomeres have been linked with an increased risk of cardiovascular disease, diabetes and major cancers. How much regular exercise people do now also appears to be a factor in their length. To track the women's movements in the study, they wore wore an accelerometer on their right hip for seven days in a row, during the day and night. They were also asked to complete questionnaires on their activity. Dr Aladdin Shadyab, lead study author, from the University of California San Diego School of Medicine, said: "We found that women who sat for longer did not have shorter telomere length if they exercised for at least 30 minutes a day. "Discussions about the benefits of exercise should start when we are young, and physical activity should continue to be part of our daily lives as we get older, even at 80 years old." NHS Choices advises older adults to break up long periods of sitting with light activity because "sedentary behaviour is now considered an independent risk factor for ill health". Older adults at risk of falls, or with poor balance, should also do exercises to improve balance and co-ordination at least twice a week. 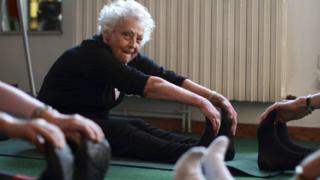 BBC - Future - Can meditation help prevent the effects of ageing?